The requirement of a ruminant animal for an amino acid must be viewed in light of the performance level expected from that animal. In general, this will be dictated by the energy supply, the supply of other nutrients and other amino acids, as well as other factors that might impact protein deposition, such as the intrinsic capacity of the animal for lean growth, application of anabolic agents, and any growth-inhibiting conditions (e.g. disease). efficiency of 66% for these functions. Version 4.0 of the Cornell model computer program calculates maintenance amino acid needs somewhat differently and leads to lower estimates than calculations based on the equations of O'Connor et al. (1993). The conversion of maintenance protein needs into amino acid needs must be considered somewhat tenuous. This is particularly true for urinary losses where the amino acid profile of the whole body is unlikely to be reflective of those amino acids contributing to the excreted N. The maintenance faecal losses also need to be carefully evaluated because often the supply of an amino acid may be calculated on an apparent digestibility basis and, as such, will account for the endogenous losses into the gut. In the Cornell model, protein requirements for growth are based on net protein deposition and an efficiency of utilization; protein needs are then converted into amino acid requirements using the amino acid profile of whole body tissue. The efficiencies of amino acid utilization for growth were determined using a protein efficiency equation developed by Ainslie et al. (1993). Efficiency of absorbed protein utilization for growth = 0.834 - 0.00114 x equivalent shrunk weight (kg). This equation, which was developed using data from INRA (1989), suggests that the efficiency of amino acid utilization for growth rarely exceeds 70% for ruminating cattle and decreases as animal weight increases. For gain, the Cornell model uses the same estimate of efficiency for all individual amino acids, and it also assumes that the efficiency of amino acid use is the same as that of protein. These assumptions are unlikely to be correct. 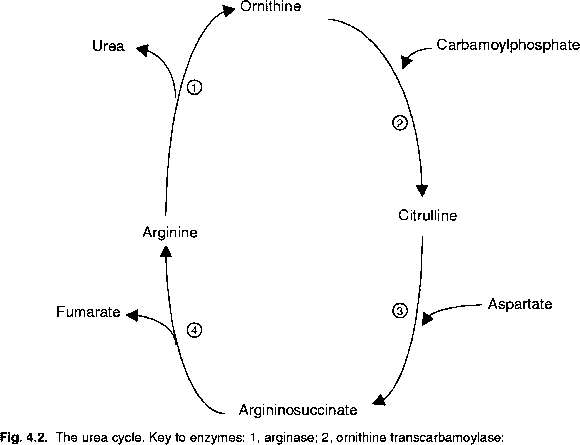 Within the framework of the Cornell model, amino acid needs of the animal are dependent upon the amount of protein deposited by the animal, which is defined as an energy-driven process. Thus, greater energy intakes lead to increases in amino acid requirements, which correspond directly to the predicted increases in protein deposition. At the same time, the Cornell model predicts that the efficiency of amino use is not affected by energy supply. This assumption is one that deserves close attention because energy intake impacts a number of factors that regulate metabolism and growth. In monogastric animals, it is relatively clear that energy- and protein-dependent phases of growth exist (Campbell et al., 1985; Fig. 18.1). Fig. 18.1. A stylistic model of energy- and protein-dependent phases of growth such as observed by Campbell et al. (1985) for pigs. 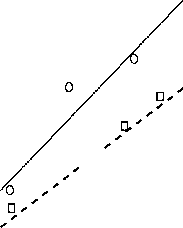 Protein deposition of animals on the inclined lines would be limited by protein intake whereas that of animals on the plateau surfaces would be limited by energy intake. For animals in the protein-dependent phase, protein (amino acid) supply is most limiting to growth, and increases in the intake of protein lead to linear increases in protein deposition. However, when the protein supply exceeds the requirement, energy becomes limiting for growth, and the animal no longer responds to additional intakes of protein. Under conditions of adequate or excess protein intake, the supply of additional energy leads to increases in protein deposition to the point where the protein supply again becomes limiting. With this model (as in the Cornell model), the energy supply is directly related to the amino acid requirement of the animal. 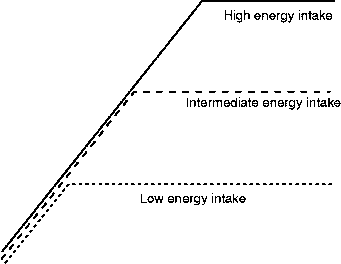 Because the protein-dependent phase of growth in monogastrics demonstrates a linear response between protein intake and protein deposition across various levels of energy intake (Fig. 18.1), the efficiency of amino acid utilization is not affected by energy supply. If this is the case, the use of a single efficiency in modelling exercise is appropriate. However, it is questionable whether or not this is appropriate for ruminants. In ruminants, the study of protein and energy interrelationships is difficult because increases in dietary energy usually increase microbial protein synthesis in the rumen and, subsequently, protein supply to the animal. One experimental model that has been used to avoid this issue is the preruminant calf in which the microbial population in the rumen has not yet developed and dietary proteins are reflective of the protein reaching the small intestine. Gerrits et al. (1996) used preruminant calves, altered the dietary protein and energy supplies independently, and measured protein deposition. They did not observe responses indicative of protein- and energy-dependent phases of growth. Rather, they observed increases in protein deposition when either protein or energy was supplied to the calves (Fig. 18.2). It is unknown if the preruminant calf is an adequate model of fully functional ruminant animals. Increased protein deposition in response to increased energy supply, under conditions where the calves also were capable of responding to increased protein supply, suggests that the additional energy led to increases in the efficiency of amino acid utilization. Fig. 18.2. Protein deposition of preruminant calves (160-240 kg body weight) in response to changes in protein intake at two levels of energy intake (Gerrits et a/., 1996). Increases in either protein supply or energy supply led to increases in protein deposition, which contrasts with clearly delineated energy- and protein-dependent phases of growth depicted in Fig. 18.1. Another experimental approach for studying protein and energy interrelationships is intragastrically maintained animals (0rskov et ai, 1979; MacLeod et ai, 1982). In this approach, the ruminal microbial population has been removed, and nutrients are supplied by postruminal infusions of protein (and in some cases carbohydrates) and by ruminal infusions of volatile fatty acids (VFA), neither of which lead to microbial growth in the rumen. The disadvantages of using intragastrically maintained animals are that only low levels of production are typically achieved and some physiological differences from normally fed animals, such as an atrophied intestinal tracts, may exist. Using intragastrically maintained yearling sheep, Lindberg and Jacobsson (1990) observed the presence of protein- and energy-dependent phases of growth. Energy was supplied as three levels of VFA infused into the rumen, and protein was altered by increasing the amount of casein infused abomasally. When protein levels were low, N retention was not affected by the amount of VFA infused, demonstrating a protein-dependent phase of lean growth. However, at the higher levels of protein, sheep had greater N balance when they were given more VFA; this demonstrated the energy-dependent phase of growth. In contrast, using intragastrically maintained lambs aged 4-6 months, Hovell et ai (1983) were unable to demonstrate separate protein-and energy-dependent phases of growth. Lambs had higher N balances when either energy or protein supply was increased. In work with intragastrically maintained steers, 0rskov et ai (1999) observed that N retention increased linearly with protein intake and that the level and profile of VFA supplied to the rumen had little effect on protein deposition. The response to protein intake demonstrates a protein-dependent phase of growth, and this would appear to be supported by a lack of response to changes in energy supply across the protein input levels tested. However, an energy-dependent phase was not demonstrated because protein inputs never exceeded the steers' requirements. When considering energy supplies, mobilization of body tissues (adipose) needs to be considered in addition to dietary energy. Ruminants, at least those near maintenance, are capable of mobilizing body fat that can serve as an energy source in support of protein deposition (Hovell et ai, 1983). This has been termed the lipotropic effect by Asplund (1994). In essence, mobilization of body fat increases the energy available to the animal and can lead to a protein-dependent phase of growth, even when dietary energy input would be considered deficient. Work with intragastrically maintained cattle (0rskov et al., 1999) suggests that body lipid mobilization for the support of protein deposition would only be important for animals near maintenance; energy supply only impacted protein deposition when glucose (i.e. gluconeogenic precursors) was deficient. Fatter animals should have a greater ability to mobilize body fat than thinner ones, so the physiological status of the animal may be an important consideration relative to energy- and protein-dependent phases of growth. Researchers also have evaluated interactions between protein use and energy supply by changing amounts of feed intake. Although energy supply can be altered conveniently in this fashion, protein supply will also change correspondingly. MacRae et al. (1995) fed growing lambs graded levels (maintenance to 2.5 x maintenance) of grass pellets or grass/barley pellets and measured the amount of amino acids deposited in the body in relation to metabolizable amino acid supply. The efficiencies of use (deposited/absorbed) of total essential amino acids were 50% for the grass pellet diet and 59% for the grass/barley pellets. This suggests that energy source (or other factors associated with these diets) impacted efficiency of amino acid use. The efficiencies with which individual amino acids were used for growth are valid only for those amino acids that were limiting. For amino acids that were not limiting, efficiencies would be underestimated because the supply, which would be the denominator for calculating efficiency, was greater than the required amount.